Last week I had a bancarella at the Italian summer outdoor market. I like to bring dolci for friends who come to visit, or anyone who stops by to chat. Buy a card… get a cookie. 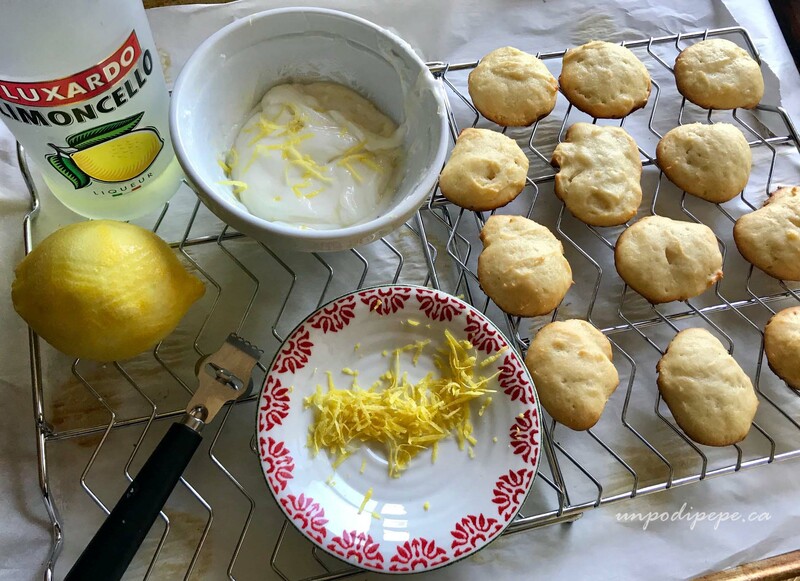 It was an unusually hot day, and my espresso cookies would melt and make a mess all over the place, so I made refreshing, sweet and tangy limoncello ricotta cookies. Limoncello and ricotta are 2 of my favourite ingredients. When I was growing up, our Abruzzesi neighbours often made these soft cakey cookies-minus the limoncello. They used Anice (ah·Nee·cheh), a liqueur similar to Sambuca, and topped them with multi-coloured sprinkles. The ricotta makes them soft, moist and chewy. If fresh is not available***, make your own ricotta! Mix the 3 dry ingredients together. In another bowl, mix sugar and grated lemon peel together with the back of a spoon until the sugar becomes fragrant. Add eggs, 1 at a time. Add oil, then ricotta and limoncello. Stir in dry ingredients. The dough is quite sticky. Use 2 tablespoons or a small cookie scoop to measure the dough onto a cookie sheet. The dough may be easier to work with if it is left in the fridge for 30-60 minutes. Bake for 15 minutes, being careful not to burn the edges. Let cool. To make glaze, mix the all ingredients except lemon peel in a small bowl until smooth. If it is too thick and sticky, add more limoncello or lemon juice. Add lemon peel last. Use a teaspoon to spread glaze onto each cookie. Leave glaze to harden and set for 1-2 hours. Makes 40-60 cookies, depending on the size. Store in a covered container. ***Cottage cheese is NOT an appropriate substitute for ricotta! Friends and customers often tell me I should be selling the cookies. I am not sure how to take that. Are they trying to tell me my baking is more appealing than my artwork? Hmmmm, I had better not overthink this one! If you love limoncello and ricotta as much as I do, check out some of my other posts: Limoncello Cheesecake, Casa Berti Olive Oil Limoncello Cake, Ricotta fatta in casa, Tortelloni di Ricotta. Read more about the mercato here. They look delicious! I must try these.. They taste like a burst of limone! Buonissimo. Must try these when I return home. Oh! 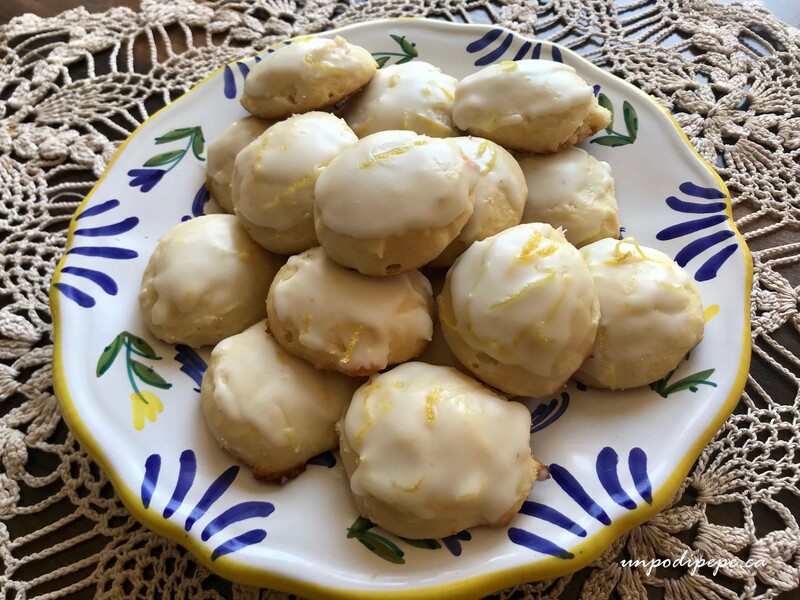 I remember you/your mom making these (the anise ones) – what a great idea subbing in limoncello for a refreshing summer cookie! Also, thanks for reminding me to make ricotta. I am going to make ricotta- and goat-cheese stuffed squash blossoms (winter squash blossoms, not zucchini) and Trader Joe’s didn’t have ricotta, so I held my nose and bought “small curd cottage cheese” which is totally not the same thing. Thank you for reminding me to make things from scratch! 🙂 I can’t wait to try these! Thank you for the recipe. These sound divine! These look so delicious and lemony! I’ll have to save some for you next time I make them Susanne!